Timeout starts counting before apk (and instrumentation) has been installed, causing the first attempt at testing e2e android on travis to fail (I haven't got bitwise to work properly with android e2e a single time yet). Running a second time allows the tests to finish on time, at least sometimes, it seems relatively flaky. Ran into something like 20 different error messages on the way, most of them having a closed issue here on the repo with the conversations locked (not very helpful). In the end I managed to find a way to make it build, by using the debug build of the private travis-ci.com, ssh into the machine, logcat android in one half of the screen and running detox test repeatedly after giving the emulator enough time to start and stabilize. After this I had to find suitable timeouts, which weren't too big for travis to think it had frozen, and allow the second run to finish. Also, a lot of different errors were avoidable by adding a 60 second sleep after the android-wait-for-emulator command, all kinds of service and permission errors show up even if the wait command finishes successfully. Would probably be useful to collect the various error messages and resolutions into documentation somewhere. Testing on iOS works good (available in the primary bitrise workflow), I even have it taking screenshots on bitwise. On travis, iOS works fine with the example project, creating a new project, installing react-native-svg (the system under test), and building (haven't tried making screenshots on travis yet). And another new project stage, using cocoapods, installing, and, building. This issue is specifically for the android workflow in bitrise, and the android "build test for example" on travis. Also, building, testing and taking screenshots locally works fine with both Android and iOS. Ideally, detox would wait for adb to install the packages before starting the timeout, or even have a separate timeout for this. And, something which ensures output at least once per 10 minutes while waiting (not to make travis believe it has crashed). I haven't looked much at the code in detox yet. But I'm thinking, perhaps this would be cleanest to solve by splitting the logic for installing the apk and instrumentation into a separate step. Such that when it finishes, one can safely call detox with the --reuse flag. And perhaps a separate command to check that the app and the instrumentation has started correctly and warmed up for testing. Is there any existing example of detox e2e testing working with android on bitrise? Using default "Hybrid (Xamarin, Ionic, ...) on macOS, includes Visual Studio for Mac, Stable channel"
Seems l have screenshots working for both iOS and Android on both ci platforms now. And hoping it would resolve the issue for good. @d4vidi Would you be interested in a PR for this? 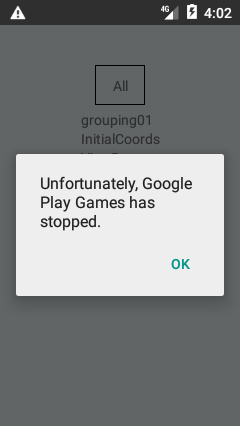 I guess the assertions are failing because mCurrentFocus is in the Application error window saying that Google Play Games has stopped, thus it thinks that the elements aren't visible. Perhaps there should be some better logic for detecting if system services have failed, and are causing false negatives because of showing modals. Such as querying mCurrentFocus and making sure it's in the expected window before making assertions about visibility. You can see from the logs that the modal was present (and got dismissed), and that the tests passed correctly. @msand first thing's first, thanks for this highly detailed report! Second, it troubles me to see that the integration process hasn't been smooth for you. I really want this to be better, and so I'd be happy if you better explain which exact timeout you're referring to. In essence, detox test should take of bringing up the device and installing the app for you, and it should feel smooth. As a side note, I'd say that on CI it's recommended that you'd have a saved snapshot of the emulator set up so it wouldn't have to cold start each time. Well I'm happy I got it working at least. It was quite a ride in debugging CI land 😉 learned a lot in the process. Detox seems very nice otherwise, thanks for your work on it! Seems we could improve it quite a lot by detecting the case that focus is outside the app, and even more if it could detect various os related errors and report them, or even deal with them. The other one is from the CI system itself, which was mostly an issue in travis, even when just installing the app apk to the emulator as I do now to avoid the jest timeout, before calling detox with --reuse. My current workaround is the travis_wait command, which is intended for long-running steps which produce no output, but still isn't a sign of hanging. Travis has a default timeout of 10 minutes, the travis_wait makes it 20 by default and can be changed with an optional parameter. This might be good to add to documentation, for using detox with android on ci. Also, the additional sleep after the wait_for_emulator command, I suspect it's a flaw with the wait command, it should look for something else to decide if the emulator is ready to get commands / have apks installed to it / e2e run on it, or detox could retry if it fails. Alternatively, could perhaps add to the documentation a suggestion to add a sleep command, but doesn't feel completely clean. Or as you suggested now, to use a saved snapshot of the emulator which has had any initial setup needed already done and given enough time to stabilize. And, perhaps even install some trivial/minimal apk to it, to verify that it works in isolation. But, correct detection of emulator readiness would be ideal. To try to narrow it down, as far as Detox is concerned, it would be better if the jest/mocha timeout would not include the time it takes for the emulator to start and for the app installation to complete. Is that the problem at its core? Well, essentially it's three separate issues I've had to work around. One to get the emulator to a state where it's safe to install the apk. One to handle that the install takes too long. And one to handle that the google services crash and takes the focus away from the app. Good observations. I'll make the issue pinned till we decide what to do about the things you've noticed.